Sometime recently, I don’t know just when or how—maybe online, maybe on television, maybe on the radio—I heard a tune I haven’t heard in years. 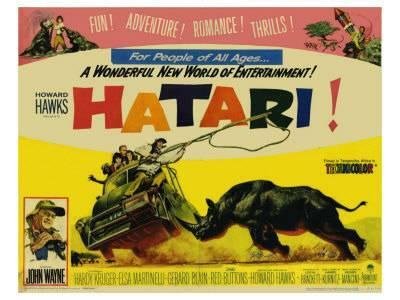 Baby Elephant Walk from the movie Hatari. Listening to it triggered a memory of watching that movie with my mother. 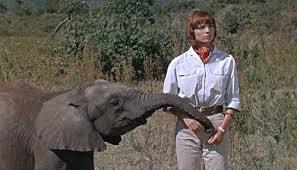 I remember a few scenes from the movie and I recall sitting with my mother, both of us laughing at the baby elephants. I remember being entranced with the music of Henry Mancini and talking to my mother about his music and other music by Mancini that I liked. My mother liked Mancini’s music, too. But there’s more to it; something about that movie and that music are necessary for me to explore. That memory came to me out of no where. I don’t think I’ve recalled sitting with my mother, watching that film, since I sat with my mother, watching the film. I must have been just nine or ten years old at the time. I wonder why, after all these years, that memory popped into my head. I’m certain I’ve heard the tune many times since then, but I don’t believe the music sparked my memory the way it did this time. I don’t think of my mother as often now as I used to, but she’s still frequently on my mind. She died when I was thirty-two years old, a year after my father died. That’s too young to lose parents. We had only been communicating as adults for a few years when they died. I miss my many years as an adult, expressing to them that I did, indeed, appreciate all they did for me and all the sacrifices they made for me and for my brothers and sisters. I don’t think children and young adults have the capacity to understand what people give up when they become parents. It takes adulthood and years of observation to understand. Of course, I am not speaking from the experience of sacrificing for my kids; I never had any. I guess I did learn something from watching my parents’ sacrifices for their six children: if you want to live beyond hand-to-mouth, if you want to have the resources to enjoy life outside the confines of the four walls of a small home, don’t have children. I learned that lesson. It stuck. It paid handsome dividends. Many people would say, by choosing not to have kids, I missed out on the most wonderful experience a human being can have. Such is life. I can’t say I regret the choice. Not in the least. Most of the time. And most of the time I think it was the very best decision my wife and I could have made. Our lives would have been radically different if we’d had children; I don’t think our lives would have been as free and as open as they have been. But, back to my recollection. What might propel that memory to the front of my mind? Music? Film? Who knows. I think I might have an inkling. I don’t think anyone else in my family had any interest in the film. I think it was something unique my mother and I shared. And hearing that music while in my frame of mind at the moment, a frame of mind that questioned whether anything about who I am and what I do is unique, took me back to a moment in time at which I felt a unique connection to my mom. This is just speculation, you understand. This is just me trying to explain something that probably doesn’t have an explanation based on facts…just theories. If nothing else, the recollection made me think about how long it’s been since mom died—thirty-two years. So that may be it. I’ve spent half my life as an orphan. I still miss her. And I miss all those conversations we should have had over the years as she watched me make career decisions and the like. I might have made a lot of other choices had I listened to the advice she could no longer give after she died. Memories are so strange, how they can pop up out of the blue, aren’t they? This was lovely to read. You were so young to have lost both your parents.